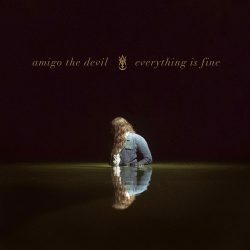 Banjo wielding singer-songwriter Danny Kiranos, stage name Amigo The Devil, teamed up with renowned hard rock/metal producer Ross Robinson (Korn, Limp Bizkit, Slipknot) to deliver this striking debut album entitled ‘Everything Is Fine’. It’s a collection of darkly humorous, brutally honest and cleverly crafted songs about death, regret, death, self-loathing, more death, a little depravity and, well, how to be a better person. Phew! The end product is recognisably Folk – there are elements of Southern Gothic, Country and Bluegrass – but what makes this album standout from the crowd maybe are the heavier rockier moments and the tragicomic theatricality of the songwriting and vocal performance. The album opens with the soul searching confessional ballad ‘Cocaine and Abel.’ A simple finger-picked acoustic guitar over piano and sparse strings creates a fluid arrangement that ebbs and flows with the emotional highs and lows of the lyric; “I was born impatient and I was born unkind, but I refuse to believe I have to be the same person I was born when I die”. ‘Preacher Feature’ is a more traditional Country waltz played real slow and featuring slide guitar and plaintive ghostly yodelling all to good effect. With song titles like ‘I Hope Your Husband Dies,’ ‘Everyone Gets Left Behind’ and ‘First Day of the End of My Life,’ this is no family picnic or, if it is, it’s a family picnic with uninvited psychotic guests. Welcome to the US “Murder Folk” scene; a genre that sounds worryingly like an item off a serial killer’s to do list. The album title is somewhat bewildering then. Frankly, everything is not fine, but maybe it is F.I.N.E. as in the classic Aerosmith track featured on the Pump album – Fucked Up, Insecure, Neurotic, Emotional. Amigo the Devil’s debut album is deep and dark and elicits an emotional response in the listener. It may not get under the skin and stay with you in the same way as a Gretchen Peters lament can, but nevertheless it is raw and authentic and definitely worth a listen. A hell of a debut album.